I didn’t ever think I’d end up with a meatloaf recipe on my site. I don’t usually like meatloaf, for one. It always seems to be dry or crumbly and has just never done a whole lot for me. I also feel like I always have made it as a default when I can’t think of anything else to make, making it just “meh” for me. But then, something happened that changed my whole outlook on meatloaf. 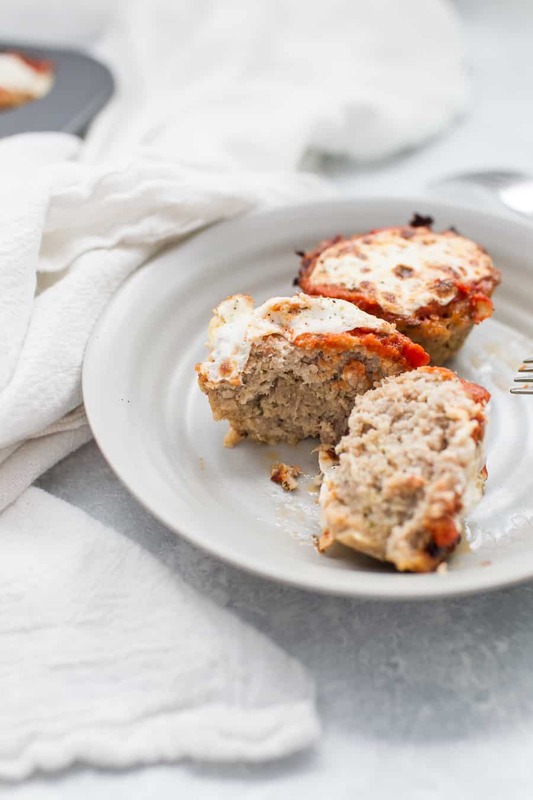 First, I discovered this recipe for Slow Cooker Italian Meatloaf from my friend Erin at The Speckled Palate. I was trying to figure out what to make for dinner one day and I had ground turkey on hand. She sent me that recipe and we loved it. Around the same time, I also discovered this recipe for Healthy Turkey Meatballs from my friend Liz at The Clean Eating Couple. I loved both recipes and wanted to sort of combine them into my own meatloaf recipe – but I wanted to make them individual portions. And that was the perfect thing to try out for Muffin Week! 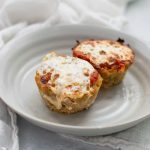 These Turkey Meatloaf muffins are everything I hoped they would be. They are moist, flavorful and SO easy to make. I love the addition of spices to really add some depth to this meatloaf recipe. 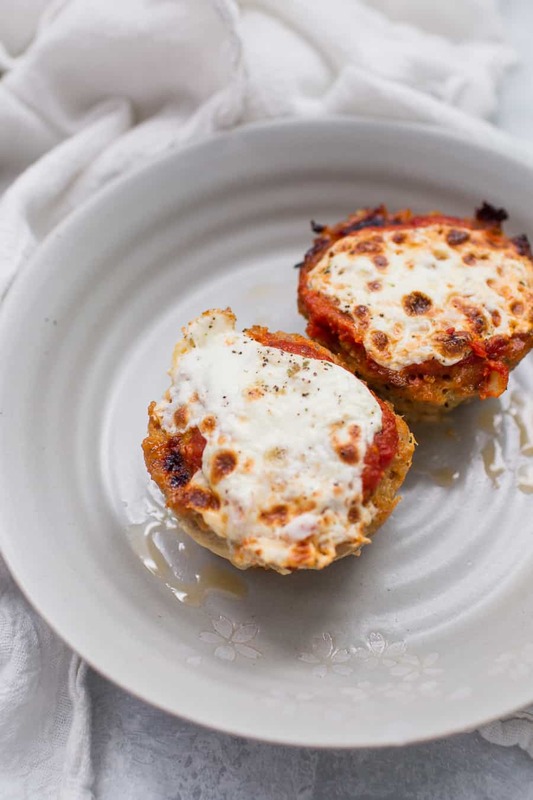 Plus the addition of sauce AND melted, gooey mozzarella cheese on top is just too good. I am very lucky that Greyson isn’t a picky eater and will usually eat anything we put in front of him, but if your kiddos aren’t that way, putting anything in muffin form is probably going to increase the odds of them eating it. Right? So if you’re in that boat with your kids, try serving them a meatloaf muffin and see what happens. I bet they’ll dig it! Ground turkey is something we constantly buy and a protein we prefer to eat a lot. So I love having options for dinners to make with turkey like these Turkey Sloppy Joe Rice Bowls or Sweet Potato Turkey Burgers. 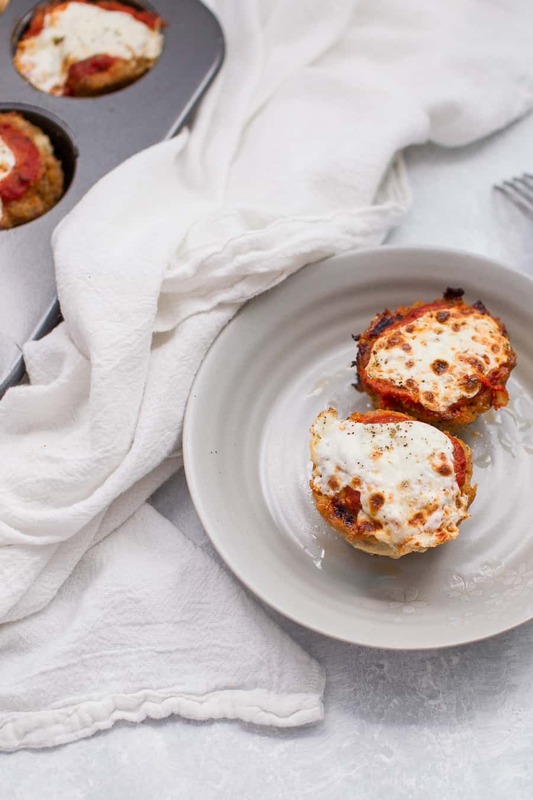 Why should you make meatloaf in muffin form? Because everything is better as a muffin. Because they cook faster! 30 minutes instead of close to an hour. Individual servings that are perfect for meal prep. 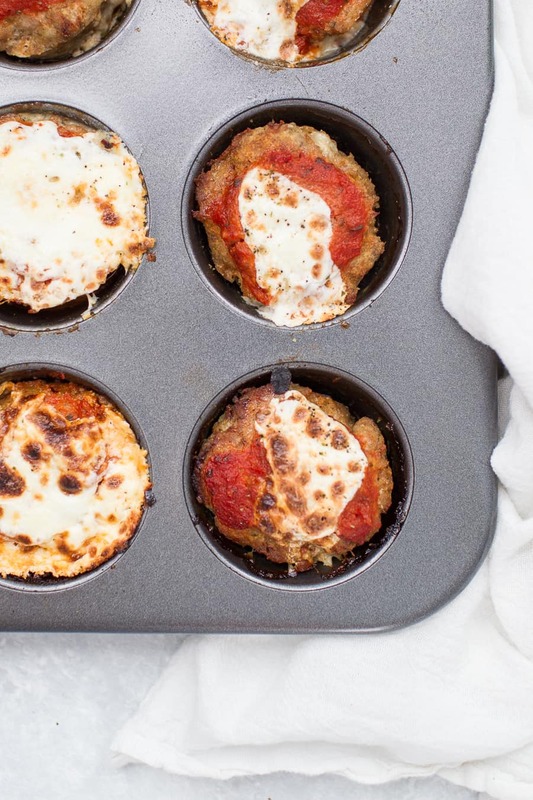 How long do you cook turkey meatloaf muffins? Bake for 30 minutes on 350°, or until the internal temperature is 165°. 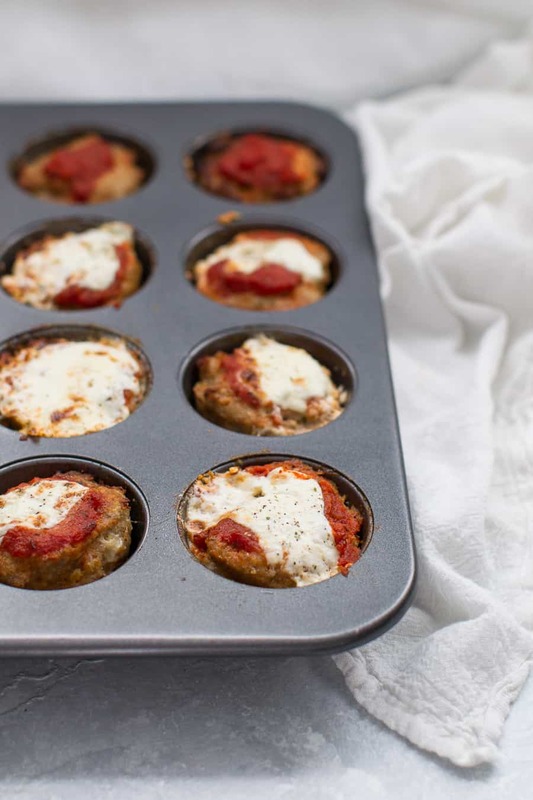 Can you freeze meatloaf muffins? Yes! 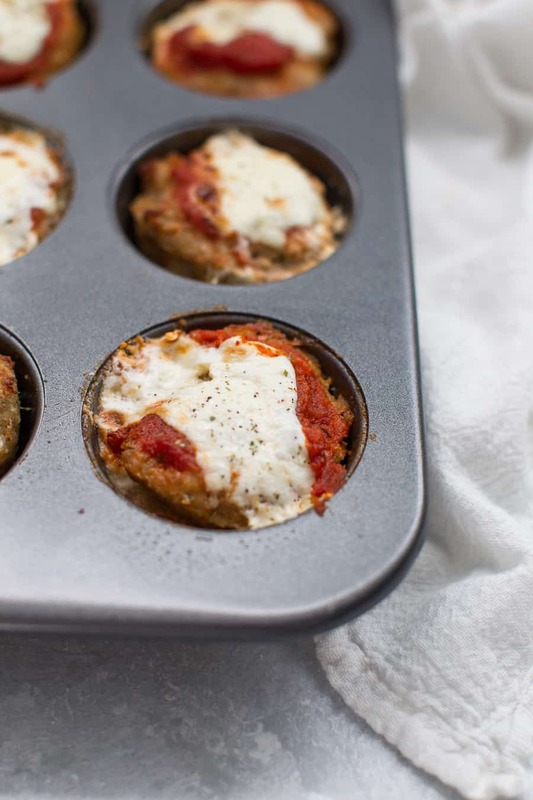 You can either freeze fully cooked, then cooled meatloaf muffins, or freeze the raw muffins. If freezing raw, freeze the whole mixture or use a large cookie scoop to scoop mixture into balls, flash freeze on a baking sheet for 10-20 minutes, then place into a zip top bag to store in freezer for up to 6 months. Either method, be sure to thaw meatloaf completely in refrigerator before reheating or baking. 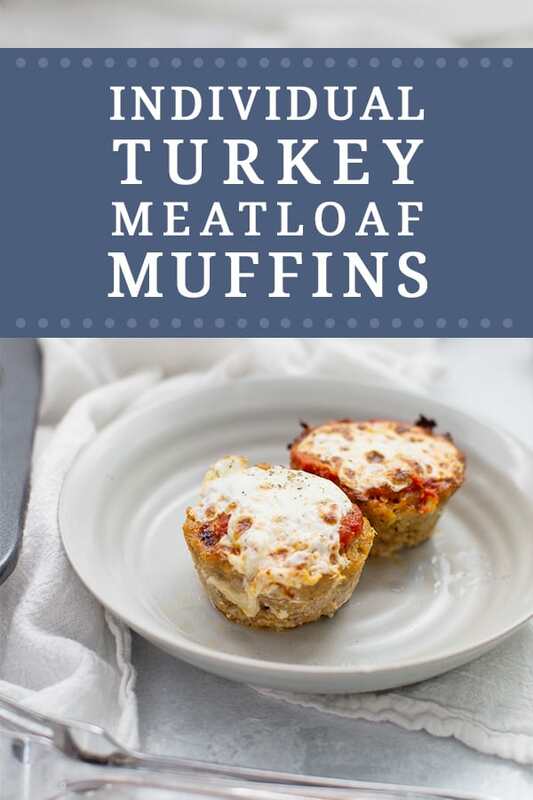 Can I use ground beef for meatloaf muffins? Sure! You can swap out the turkey for ground beef and the cooking time should be the same. Be sure to test the internal temperature with a meat thermometer. How can I make these dairy free? Skip the mozzarella (or use dairy free cheese on top) and use dairy free milk. You can use almond meal instead of bread crumbs to keep this gluten free. Can I use fresh herbs instead of dried? Absolutely! Fresh herbs are less concentrated than dried herbs, so you’ll need about 3x the amount of fresh herbs. How do you keep meatloaf from getting too dry? Part of the solution is the cook time and part of it is the ingredients. What can I serve this with to make it a full meal? You can serve this with rice and vegetables like Garlic Brown Butter Green Beans or maybe Prosciutto Wrapped Broccolini. Save this recipe to make later! As always, if you’re thinking about making this recipe (or you do!) I’d love to know. Leave a comment and rating below! Preheat oven to 350°. 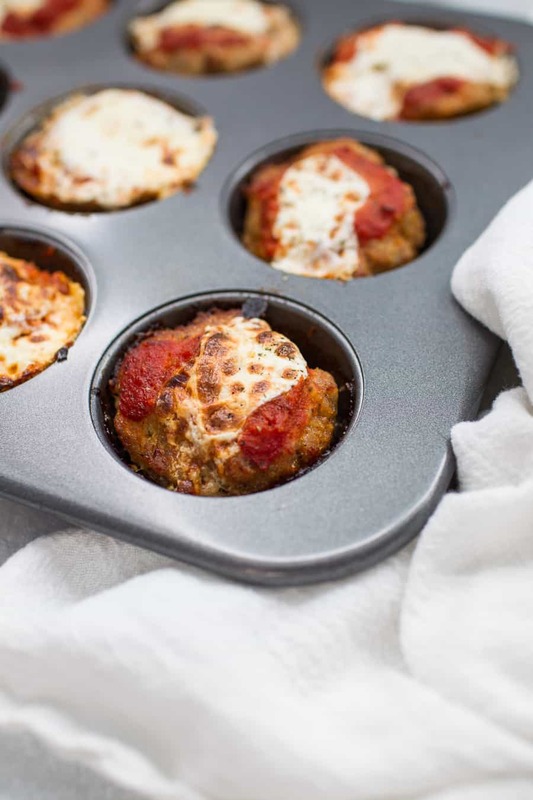 Grease a 12 count muffin tin and set aside. In a mixing bowl, mix together all ingredients, except tomato sauce and mozzarella. Using a cookie scoop or spoon, add meatloaf mixture to every muffin tin, packing each one as much as you can (they will not rise). Bake for 23 minutes. Remove from oven, top with sauce and a slice of mozzarella and broil on high for remaining 7 minutes. Be sure to check internal temperature (165°) to make sure they are fully cooked. We are big meatloaf fans and love making sandwiches with it the day after. 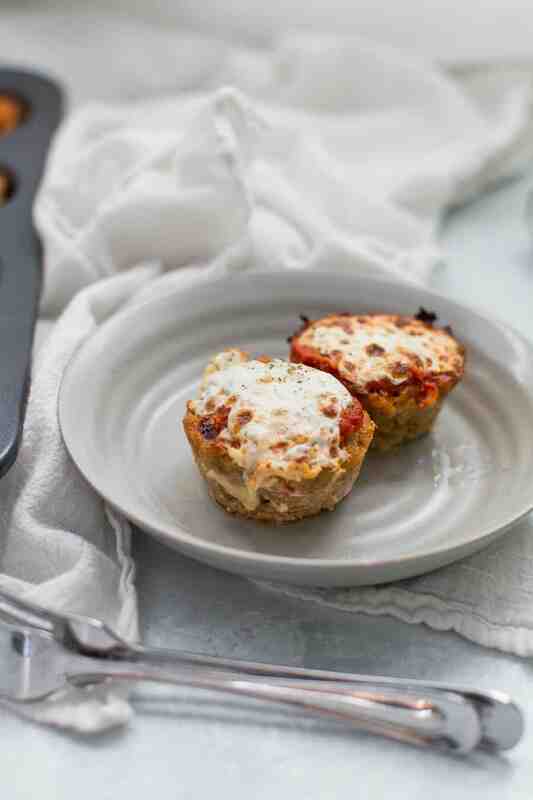 This being in muffin form makes it easy for a portable lunch also!